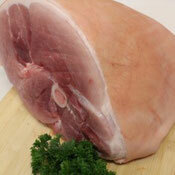 We now have gammon steaks! 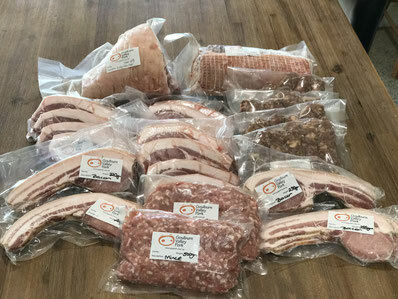 Please find below a comprehensive listing of all of our available delicious products. 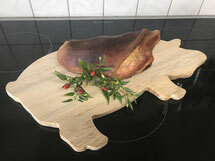 Any items listed as Special Order are cuts that we butcher to order. then please email us using our convenient order form. 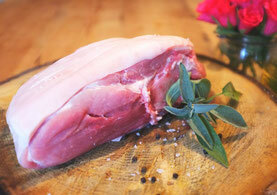 A gorgeous moist leg of pork, perfect for a Sunday Roast. 3 sizes available small, medium & large. 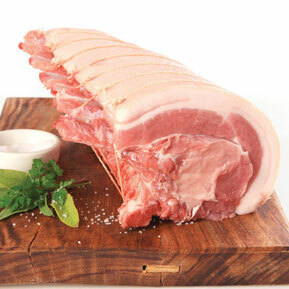 Pure Paddock Pork Shoulder bone in, a tender and juicy piece of meat, produces a beautifully moist roast. A beautiful boneless rolled shoulder of our pure paddock pork, its tender and moist and with a crackle people will rave about. 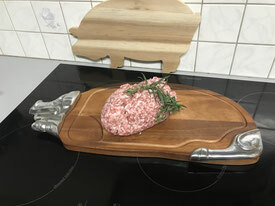 The hand of pork is a part of the front leg/shoulder and has the best crackling, as well as a beautiful tender moist meat. ROASTING RACK - $28 PER KG. Beautiful rack of pure paddock pork. Impress your friends at your next dinner party. Available Sizes 4 point, 6 point & 8 point Rack. 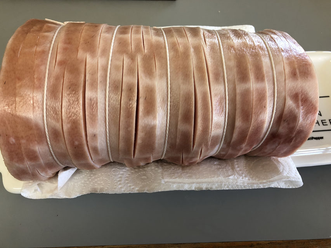 Beautiful rolled loin of pure paddock pork. Perfect for the spit at a party, or for your Weber. 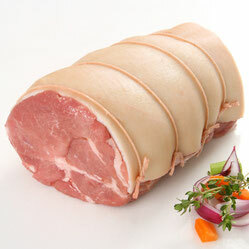 Available in sizes from 2kg to 8kg whole rolled loin. Let us know how many people you want to impress and we can have it butchered to your desired numbers. 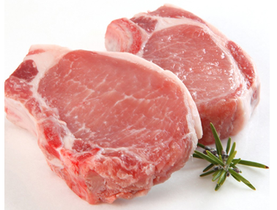 Succulent pure paddock pork steaks, vacuum sealed in bags of 2. Lean and moist tender steaks. sizes vary in weight from small, medium & large. 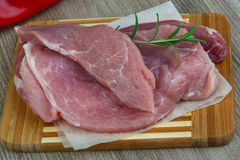 Lovely and tender pure paddock pork loin chops, vacuum sealed in packs of 2. Beautifully tender and succulent chops. 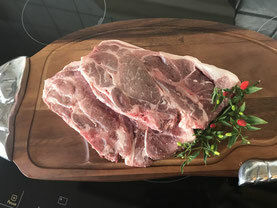 Lovely and tender our forequarter chops are great for BBQ's or a quick and easy evening meal. Vacuum sealed in packs of 2. 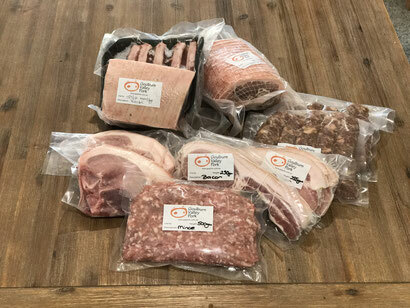 Variety of Flavours - We will speak with our butchers and update this product shortly. 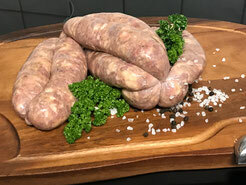 There will be Italian & English Pork sausages to name a few. Available in 500gm and 1kg packs. 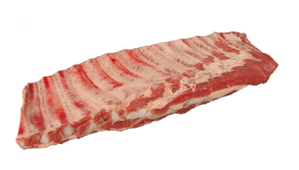 Very popular delicious pure paddock pork spare ribs. sizes for 1, 2 or 3 people. Beautiful delicious tasty and tender pork schnitzels. 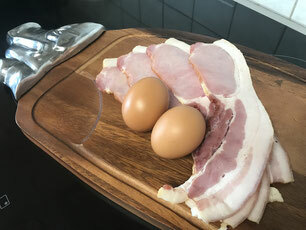 Our beautifully naturally smoked bacon will have your mouth watering as it pops and crackles in your pan. No more boiling bacon, just frying bacon like it used to be! Truly incredibly flavoured bacon, once you've had a taste you wont go back to the supermarket shelves. conveniently vacuum sealed in 500gm Packs. 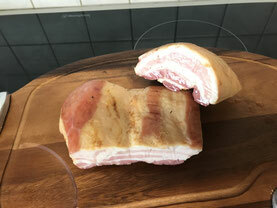 Beautiful pure paddock pork bacon speck, sometimes called streaky bacon. 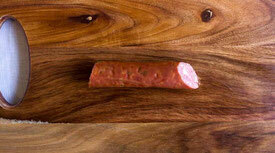 Its beautifully smoked flavour is amazing, not to mention you can cut it as thick or as thin as you like. 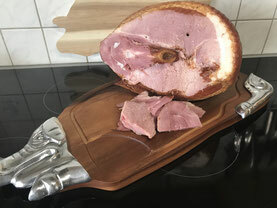 A beautiful tasting perfectly smoked ham on the bone. Its succulently moist and has the most incredible flavour. Once you start carving pieces off, you wont be able to stop yourself eating it. Gorgeous smoked ham hock, they come vacuum sealed in single packs. 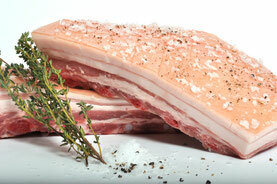 Beautiful pure paddock pork belly has a gorgeous velvety meat and a succulent crackle. You need to be quick as this is one of our best sellers. Succulent pure paddock pork mince. Available in 500gm & 1kg packs. 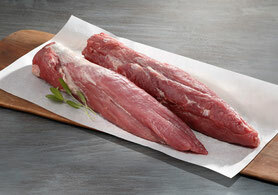 TENDERLOIN FILLET OF PORK $40 PER KG. 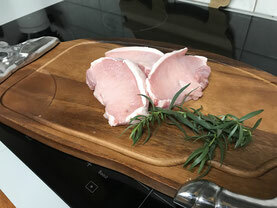 Beautiful Tender Pure Paddock Pork Fillet. This is the most tender and succulent portion of pork. 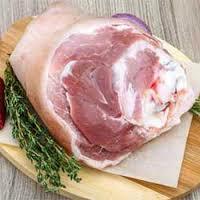 Lovely fresh pork knuckle, they come vacuum sealed in single packs. 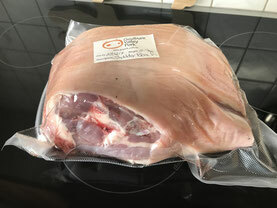 Pure paddock pork trotters, come vacuum sealed in a pack of 2 trotters.